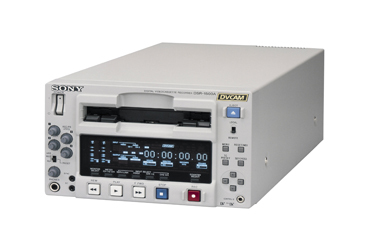 The Sony DSR-1500AP DVCAM VTR is a compact, half rack player/recorder that makes it ideal in production vehicles, desktop editing suites or in any location where space is at a premium. The deck is an excellent solution for the complex nature of professional video editing today. It plays back the consumer DV format as well as DVCPRO recorded tapes (in addition to its native DVCAM). The unit will also record in DV making extra-long duration recordings simple. Signal outputs include composite video, Y/C, and analog component video standard. Aside from iLink (Firewire, IEEE1394), the video inputs are optional. Separate supplementary digital SDI input (DSBK-1501) and analog component input (DSBK-1504) boards is required. With its test signal generator (bars and tone), the DSR-1500AP can be a cornerstone of a modern video edit suite. This is the European standard PAL model. DVCAM / DV Play and Record: DVCAM is the Sony professional offshoot of the ubiquitous DV format. The advantage of DVCAM is obvious. It offers better picture quality, better multigenerational dub characteristics, and better than CD quality audio. DV offers longer recording times (maximum 270 minutes versus 180 minutes in DVCAM) and more economical tapestock prices. The deck will play and record in both formats letting you decide which features are most significant. And the DSR-1500A will also playback DVCPRO recorded tapes, though it will not output DVCPRO through its optional digital boards. i.LINK Interface: Built-into the DSR-1500AP VTR is the i.LINK interface, which is based upon the IEEE1394 (DV, Firewire) standard. The i.LINK enables a single cable to simultaneously carry digital video and audio signals, as well as data and control signals with virtually no quality degradation. This simple connection offers an ideal solution for connecting the DSR-1500AP with i.LINK interface equipped compatible nonlinear editing systems and other computer-related products. Digital Slow Motion and Jog Sound: The DSR-1500AP offers a variable speed playback function with a range of -0.5 to +0.5 times normal speed. Within this range, the unit can play back digital noiseless slow motion pictures and jog sound. This makes it possible to locate editing points quickly and accurately. Frame Accurate Editing, the Old School Way: The DSR-1500AP is equipped with an RS-422 remote control connection to interface with the other RS-422 equipment. The deck has a full complement of analog outputs, component, Y/C and composite, built right in. Analog inputs can be added with the optional DSBK-1504 board. The deck is right at home in an analog edit systems such as those found around Betacam suites. A Control S connection is available for the DSRM-20 jog shuttle remote, also. Serial Digital Signals for Unsurpassed Studio Quality: Uncompressed digital video signals, like those found in Digital Beta and D-1 environments can be input or output with the addition of the DSBK-1501 board. In addition to SDI, SDTI video and AES/EBU digital audio are also carried through these connectors. Test Signal Generator: The DSR-1500AP has a built-in test signal generator. The deck will output SMPTE color bars, black burst, and 1kHz audio tone. These signals are necessary as standards for consistent video and audio production. Auto Repeat Feature: Auto repeat function is available through the VTR menu setting. Designated time code can also be set as start and stop points.